eHostPK Review 2019: Is eHostPK a Good Hosting? eHostPK is a rapidly growing web hosting company that offers shared web hosting and VPS hosting with affordable pricing. Catering to individuals and businesses around the world, eHostPK makes web hosting easy via a premium website builder, one-click app installer, intuitive user interface, and more. eHostPK is a Pakistani web hosting service that was founded in 2013. It provides competitively-priced plans to empower individuals and businesses in the region to establish an online presence. With over 5,000 active clients around the world and servers located in three countries, eHostPK has demonstrated an ability to provide excellent service worldwide at great prices. eHostPK provides shared web hosting, managed business hosting, reseller hosting, and Windows and Linux-based VPS hosting. It also offers an array of web design and marketing services to help small to mid-sized businesses launch their own websites. eHostPK occasionally offers attractive deals, so look out for those deals and promo codes on the company’s social media pages. It offers a 30-day money back guarantee and if you decide to sign up there are no setup fees. eHostPK’s pricing is on the low side and the price is more than affordable for individuals and small businesses. This is true even when you take into account that domain registration and SSL certificates will be additional costs. Those on business hosting plans have the option to pay monthly, but those on the regular shared hosting plans have to register for an annual contract at minimum. You can make payment via Mastercard, PayPal, Easy Paisa, UBL Omni, Mobi Cash, or bank transfer. There are no cancellation fees if you decide you no longer want to have your website hosted with eHostPK. It’s also very easy to move between hosting plans; this can be done at any time. eHostPK’s customer service is quick to respond and holds true to its promise of 15-minute response times. Support is available through phone, live chat, tickets, and email 24/7. 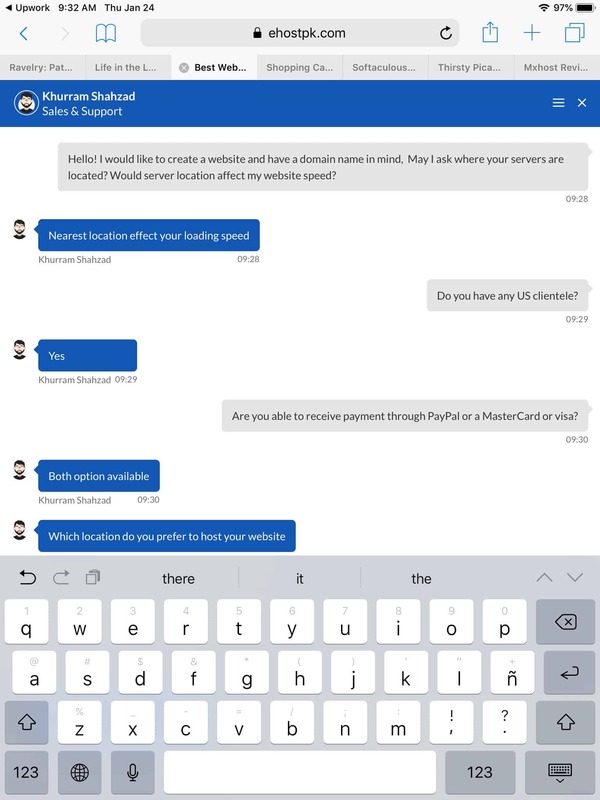 My questions were answered very quickly; within two minutes of accessing the live chat, I was connected with an agent who promptly answered all of my questions. With an affordable range of plans and no setup or cancellation fees, eHostPK is an inexpensive option for individuals and SMEs in Pakistan just starting out with web hosting. Wondering how eHostPK stacks up against other Web Hosting companies? Enter any other Web Hosting company and we will give you a side-by-side comparison.